The document below shows that lands purchased by William Pryor Letchworth for his Glen Iris Estate which became the basis for Letchworth State Park. 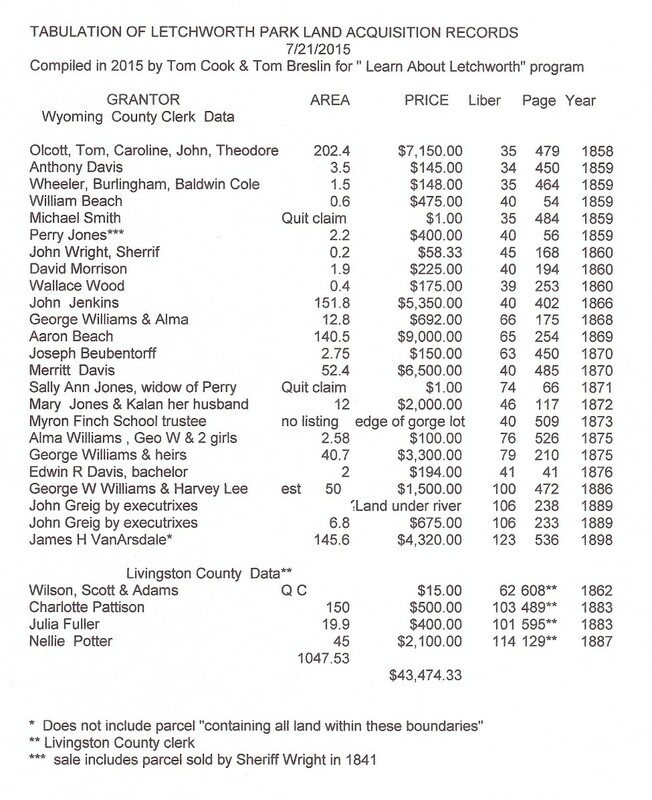 In the chart the grantor is the person selling him the land, the area is the amount in acres and the price listed is what was found and not converted to modern values. We have also indicated the deed record book (liber) and page where the deed was found. Finally, we list the year in which the transaction was made. The deeds found at the bottom were from Livingston County, all the rest are from Wyoming County. You will find more information about the tabulation below the chart. The data was compiled in preparation for a presentation as part of the “Learn About Letchworth” program, which was started by Tom Cook about 1979, as informative sessions, open to the public and remain a feature every year. The subject of this presentation was how Mr Letchworth acquired the acreage of “One Thousand Acres” to eventually give to the State of New York as a public park. We were also interested to examine the time frame involved in his land acquisition efforts. We searched the County Clerk’s offices in Wyoming and Livingston Counties for deed records showing transfers of property to Mr Letchworth. These Clerk’s offices are also the repository of pertinent maps that surveyors prepare and have recorded for future reference. All of these records are kept for use by the public. This listing is our best effort at putting together the information we found on record and we do not claim that it is without possible flaws that are inherent in the old handwritten deeds, or in our comprehension of the data we found. We hope that future research into Allegany County deeds prior to 1842 might help to clarify some questions we have on the later deeds. The Wyoming County Clerk has a map recorded in the records for the Town of Genesee Falls, prepared by John Minard titled “ Map of the Estate of William Pryor Letchworth…”. We relied heavily on a tracing of that map to illustrate the growth of the estate. In the process we discovered some interesting facts. The eventual deed to the State (Wyoming County Liber 158, P50-53) follows the Minard map using the bearings and distances around the perimiter of the property up until the addition of the acquisition from James D. VanArsdale in 1898 of the lands owned by James Conway at the time of his death which we will show in Part 2. The primary fact and one that we noted frequently during our studies was that Mr Letchworth was a very prudent and careful businessman. He was known for this trait in general in life and it was borne out in his land acquisition work. He had a group of purchases agreed upon before he actually purchased the land as the reader will see in Part 2. Mr Letchworth was willing to propose mortgage situations and frequently did. Most often these deals were between the parties to the sale with the seller accepting partial payment and holding the mortgage rather than dealing through a bank as is the modern way. The terms were very flexible and I never saw one requiring interest. One deal involved Mr Letchworth promising to pay $500 per year for two years to make the full purchase price he had negotiated. We were surprised to see hand drawn tax stamps added to deeds in the 1850’s era. I also noted a couple of times that a notation was made on the bottom of a deed giving the magnetic declination that applied to the bearings for a boundary section. Finally, we should note that the 1889 John Greig transfer found in the list above, is very unusual as it conveys the land under the water of the Genesee River, but what makes it interesting is that it describes it as being from bank to bank which means all the way up the steep banks. Deeds to Mr Letchworth frequently merely say “to the bank of the Genesee river” or to “the Genesee River , thence along the river” so the actual metes and bounds are not given but end when the next landmark is reached beside the river. The extent of this blows the area well beyond the 1000 acres. This originated when the Cottringer tract was formed overlapping the river but none of the lot lines cross the river. For a more detailed discussion of Mr. Letchworth's land purchases, please go to Part 2.